I have several potted fairy garden spaces on my little patio. My grandchildren love to move the houses and tiny chairs from one garden to another. I can almost see their imaginations lighting up as they play. I love to watch them play and explore. I sincerely believe that creating fairy gardens with children helps them to develop an appreciation and love for gardening. They learn that plants are living things, they change and grow, and need to be cared for. They use their imaginations to create scenes and environments. They learn about weather and how it affects their fairy garden – wind and rain. Pinterest has lots of ideas for projects to help children build fairy gardens, fairy houses, and accessories. They can set up their fairy gardens in a tiny flower pot or under a shade tree, or in the corner of a vegetable garden. If you live in a cold climate you can even create a terrarium or indoor garden with your children. 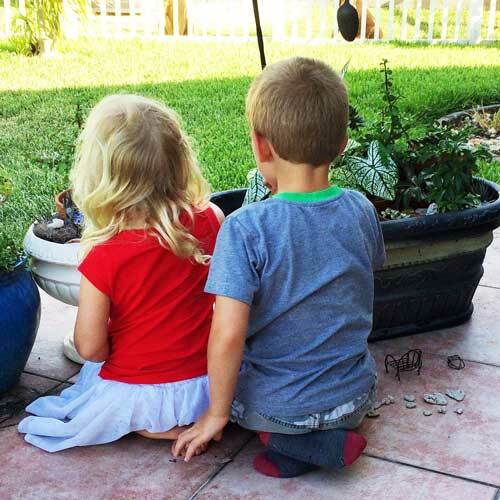 Teach the love of gardening to the next generation and build a fairy garden. I would love to hear your stories and share photos of your projects! Fairy Garden – Where to Begin?